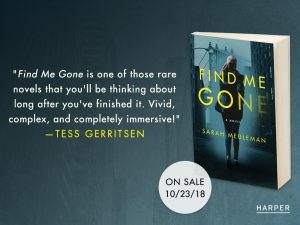 First blurb about FIND ME GONE…American bestelling author Tess Gerritsen has read the book and said: ‘Find Me Gone is one of these rare novels you’ll be thinking about long after you’ve finished it. Vivid, complex and completely immersive!’ I feel honoured and grateful. Thank you, Tess Gerritsen!